On December 30th, 1460, the heirs of the Lancastrian Nobles killed at St. Albans found themselves able to avenge their fathers' deaths when their army trapped the Duke of York and Earl of Salisbury in Sandal Castle, near Wakefield. Lured out from the safety of the castle walls and into open battle, York's heavily outnumbered force found themselves surrounded and in the fierce melee that followed, York and many of his followers lost their lives, his son, Edmund, amongst them. The Earl of Salisbury was captured and taken to Pontefract by the Duke of Somerset where he was summarily executed, his head joining those of the other Yorkist leaders over the gates of York. However, the Lancastrian triumph was to be short lived, for they were almost totally annihilated three months later at the battle of Towton. Giclée Print published from a gouache painting by Graham Turner. Each print individually printed to order on very high quality heavyweight paper, and then signed on the border by the artist. Also available as a smaller sized open edition print for £17 - CLICK HERE for details. Scroll down to see larger cropped detail image. CLICK HERE for more information about Giclée Prints, which are individually printed on very high quality paper or canvas by the artist, Graham Turner, ensuring a print that is as close to the original painting as possible. The series of battles fought between the rival Yorkist and Lancastrian claiments to the English throne during the second half of the 15th century are now known as the Wars of the Roses, after badges carried by supporters of the two factions - the white rose of York and the red rose of Lancaster. Political tensions erupted into open conflict at the first battle of ST.ALBANS in 1455, when the Duke of York took up arms against the Lancastrian King Henry VI, and this battle is one of several that Graham Turner has brought to life in his series of paintings devoted to this turbulent period in our history. 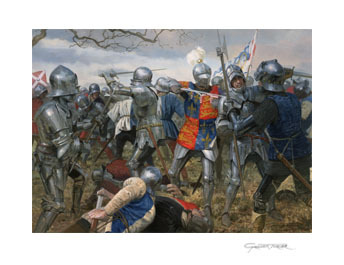 WAKEFIELD, TOWTON, NORTHAMPTON, BARNET, TEWKESBURY, and BOSWORTH - where Henry Tudor defeated Richard III - these are some of the other battles that have been painted by this highly regarded historical artist who specialises in medieval history, all of which are available as prints from Studio 88. CLICK HERE for details of the complete range of open and limited edition MEDIEVAL PRINTS by Graham Turner, priced from £17.